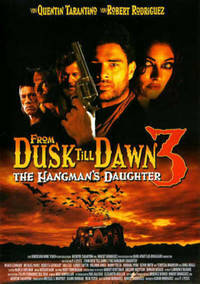 From Dusk Till Dawn 3: The Hangman's Daughter is a 2000 American horror film directed by P. J. Pesce. It serves as a prequel to the 1996 film From Dusk till Dawn. It was released directly to video and was nominated for the Saturn Award for "Best Home Video Release". In late 2010, the production of a fourth film in the series was discussed, but, as of August 2012, further work on this possibility has not been revealed. In late 2013, it was reported that a TV series had begun production. This webpage uses material from the Wikipedia article "From_Dusk_Till_Dawn_3%3A_The_Hangman%27s_Daughter" and is licensed under the GNU Free Documentation License. Reality TV World is not responsible for any errors or omissions the Wikipedia article may contain.